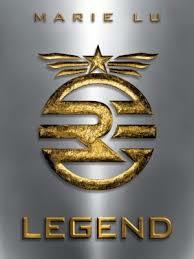 Legend is my favorite dystopian novel. My students agree. Legend moves quickly between chapters written by June and Day. June is a brilliant 15 year old girl who got a perfect score on the Republic’s trial and is being trained to be one of the Republic’s top soldiers. Day is 15 year old boy who failed the trial, escaped a labor camp, has become a criminal and the Republic’s number one enemy. Day and June live in Los Angeles where the rich live alongside the poor in different sectors. The rich live in beautiful modern buildings and have plenty of food. The poor live in broken down buildings and and fear the plagues that spread regularly throughout their neighborhoods. Day and June have never met, but June knows that the most important mission in the military is catching Day. Their lives intersect when Day’s little brother contracts the plague. Day, desperate to find vaccines to save his family, breaks into a hospital. As he tries to escape, June’s brother, a Republic soldier is killed. Day is accused of killing him, and June is consumed with the need to find and arrest Day. In her quest to caputure Day, June uncovers things that shake her belief in the Republic and make her wonder if Day is really the enemy at all. This book combines fast-pacing, mystery, action, suspense and a little romance into a great novel. Highly recommended for tweens and middle school. I’m looking forward to reading Marie Lu’s sequel to Legend, Prodigy. 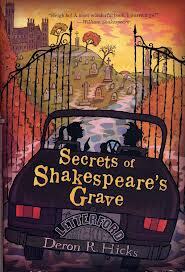 Here’s a book I really enjoyed from my summer reading list: Secrets of Shakespeare’s Grave, by Deron R. Hicks. This is the first book in the Letterford mysteries. Beginning in the year 1616 on Mont Saint Michel on the coast of France, the reader is immediately engaged as a man breaks into a church in order to remove an item that he has been asked to protect. Flash forward to 1623 when a man is asked to built a mysterious device in a small room. Flash forward again to the present day as newspaper articles tell of the misfortunes of one famous publishing house, Letterford Publishing. Chapter 2 takes the reader to Manchester, Georgia where we meet Colophon Letterford, the 12 year old daughter of Mull Letterford, the beleaguered owner of Letterford Publishing. As the family sits down to Thanksgiving dinner, a mysterious and unkempt Cousin Julian arrives. Colophon learns that Cousin Julian is trying to find a treasure, supposedly hidden by Colophon’s ancester, Miles Letterford. Together, Colophon, her older brother Case and Cousin Julian set off to solve the Letterford mystery and hopefully save Letterford Publishing. This is a fast-paced, intelligent mystery perfect for upper elementary readers. I can’t wait to recommend it to my students. This is a beautiful and magical book. I haven’t read an elementary fiction novel that has captivated me like this one did in a long time. I knew exactly which student I would ask to read it, one of my favorite third grade readers, now a fourth grader. She loved the book as I suspected she would. I wasn’t writing my blog when I first read this book, otherwise it would have been one of my first posts. I loved “having” to reread this book in order to write this recommendation. Where the Mountain Meets the Moon is the story of a girl named Minli who lives in the shadow of Fruitless Mountain. Her village, the mountain and everything around are grey and poor. Minli and her parents work all day to plant rice and grow barely enough to feed themselves. Minli’s mother constantly frowns and complains about how hard their life is. The only brightness in their existence comes from Minli’s father’s stories. Ba tells stories of the Fruitless Mountain, The Story of the Old Man of the Moon and others. One day, Minli buys a goldfish from a peddler who tells her that it will bring her family good fortune. She spends all her money on the goldfish. When her mother gets angry that Minli has spent all her money on a goldfish that will have to eat some of the little rice they have, Minli realizes that she must let the goldfish go. So begins her adventure to find the Never-Ending Mountain and the Man of the Moon to bring her family good fortune. 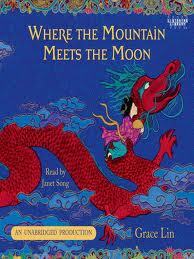 I loved the way this book wove Minli’s story with the stories that formed the legend of The Man of the Moon. I also loved Minli’s quick mind and determination. This is a great book for elementary school readers. I think this book would make a fantastic read aloud for third or fourth grade classrooms as well. Highly recommended. This book was a Newbery honor book and a Junior Library Guild selection. I’m looking forward to reading Grace Lin’s next book, Starry River of the Sky, published in 2012. Here’s a book from my summer reading list that surprised me. I was worried that this book would be heavy handed. Instead, I found a rich story; and, although it is a fictionalized account, this story based largely on historical fact. It took me a little while to get into the book. As I kept reading, the writing seemed to become smoother, and I became totally absorbed in the story. I couldn’t put it down. I will definitely recommend this book to tweens and middle school. 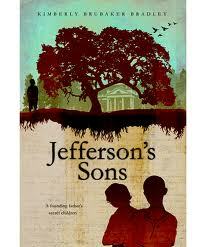 Jefferson’s Sons starts with the story of Beverly, Thomas Jefferson’s oldest son with Sally Hemings, his slave. Beverly pines for his father’s love and is constantly reminded that he may never speak about his father to people outside his family. I was starting to wear on this theme but became really interested in the book as it changed voices to his next son, James Madison, or Maddy for short. Maddy’s voice is angry. He feels the indignity of being a slave more deeply and is bitter that of all Sally Hemings children, he is the only one that can not pass as white because of his dark skin. With each changing voice, the author provides another perspective to being Thomas Jefferson’s child. This technique added a lot of interest for me. As the story progresses, readers learn of the huge debts that plagued Thomas Jefferson’s household and how those debts would ultimately affect the lives of everyone at Monticello. I was so interested in this story that it sparked my interest in Thomas Jefferson. I spent time on the Monticello.org web-site, reading about Sally Hemings and her children as well as looking at the Monticello grounds and pictures of Thomas Jefferson. There, on Monticello.org, you’ll find that there was a DNA study done that confirmed that Thomas Jefferson was the father of Sally Hemings children. I’m excited to recommend this book to my students and teachers in the fall. Do you prefer dogs or cats? Many people have strong preference for one or the other. Well, here’s the book for you. Whether you prefer dogs or cats, here’s a great opportunity for you to learn more about both. This book is a “flip book”. 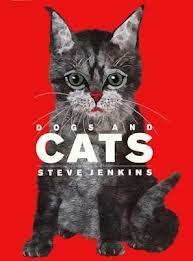 Start reading about dogs, then flip the book over and read about cats – or visa versa. This book provides lo ts of great information dogs and cats, including the number of breeds, their origin, behavior, their expressions, how they grow and other interesting facts. On each dog page in the corner, there is a fact about cats that relates to the information on the page and visa versa. 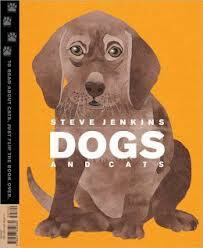 There is even a page on how dogs and cats interact in the wild and in a home. The beauty of this book is the way it presents information in small, digestible amounts. If you know a child that loves animals, this might be a great choice for them.